The last stop on our trip was Socialcam to visit Michael Seibel. Socialcam was recently bought by Autodesk, so their office was in a transitioning phase. Michael met us at the door with a ton of enthusiasm and, much like all the other entrepreneurs we met, a wealth of knowledge and advice. We sat down in one of their conference rooms and he asked us what we would like to know. There were a few questions and concerns that we expressed to him. He was able to pull experiences from his own life that allowed us to truly relate. One of the first things we brought to his attention was some of the problems we faced when trying to come up with an idea. His response elaborated on the misconception that the idea is what is most important and it needs to be perfect from the start. The idea is not as important as first finding a group of people to be a part of team. People will different skill sets and backgrounds make for a good team. However, the team should not differ too much. Otherwise, there will be too much clashing and nothing will get done. Multiple minds are better than one. Once your team is formed, the idea is not to create one seemingly perfect idea. Odds are that it is not perfect and it will most likely fail. The key is to go in knowing that. It will help in the long run. Just know you have people who are willing to help. Another thing he talked about was the importance of being somewhat established when you pursue ventures involving a startup incubator like y combinator. They look through hundreds of applications. If you have not launched your product, don't have a customer base, statistics and some type of prediction regarding the future of your product, they will probably not give you a second glance. It's more beneficial to not haphazardly submit something that is not complete. They want to see certainty and a finished product. Only then will they give you a chance. We sat for a long time talking to Michael, hearing about his time in school and his pursuit of his dream. He made it very clear that he and the other entrepreneurs we visited (and many others) are beyond willing to help out budding entrepreneurs still in school. He said that so many people were there for him along the way, so he would love more than anything to return the favor and help out students. I spoke of this in an earlier blog post, but I really want to reiterate something that is very important. Every single person has the ability to do great things. Whether that be in a startup or in some other career remains to be seen for many people. As long as you have the motivation and are willing to accept that things may not go your way 100% of the time, you too can become the next Weebly, Socialcam, Hipmunk, Sincerely, or Dropbox. All of the people we met this week were in our shoes not too long ago. They worked together and buckled down and were able to do something incredible. This trip has been life-changing. I have a whole new outlook on every aspect of life after college. I hope that after reading our blogs and following our trip you have been inspired on some level and may one day make the trip to San Francisco. Even if you go just to do what we did initially and get a feel for startup life, it's completely worth it. Life is what you make of it. Do what makes you happy and the rest will follow. Today we met up with Chris at the Weebly office and he took us to see their datacenter. Due to security there are no pictures of our trip so I'll try to tell it all here. Weebly is in the same datacenter as the original Facebook, Craigslist, Twitch TV, and Justin.tv. Personally I'm a networking junkie so this was probably more fun for me than Adam, Hoss, and Chase but it was pretty cool to see the servers, routers, and switches that make Weebly run. One of those servers is where this website is hosted which was pretty cool. The datacenter was in a location you wouldn't expect; next to some abandoned railroad tracks. Chris said that a lot of datacenters around here are located near the tracks because it was really easy to run fiber connections because the railroads are big open flat spaces. Can we all just take a minute to appreciate how awesome Steve is? Steve Huffman is a co-founder of Hipmunk, which aims to take the agony out of travel search. For those of you who aren’t familiar with the site, you will fall in love with it with your first search. We used it to plan our trip! Among walking into their office, we immediately saw what we now know are staples within the startup community: a ping pong table, a pool table, and a open space for work and collaboration. Steve showed us around, gave us a lot of insight to Hipmunk, startups, and fun in San Fransisco. Hipmunk was a little different from other startups we have seen. Many startups we toured are loaded with engineers, but Hipmunk was evenly distributed between business oriented personnel and engineers. 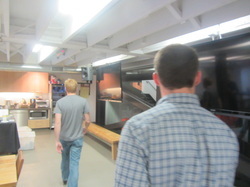 When touring Zynga, we saw a few hundred engineers and designers. At Weebly, they were very focused around engineers as well. Hipmunk was different, but the startup culture and set up were the same. We are very appreciative of Steve and his crew for letting us drop by. Alcatraz Island, also known as “The Rock”, was a lighthouse, military fortification and prison, and a federal prison over its 113 years of use. Since its closure as a prison, Alcatraz has been a National Recreation Area and National Historic Landmark. When we arrived to the island, we walked around the island and saw the remnants of the officers quarters, the morgue, military posts, and other buildings that served the tenants of the island. Once we finished our self-tour, we took a audio guided tour which included the cellhouse, dining hall, library, warden’s house, control room, and the recreation yard. We learned about the daily lives of prison guards and their families as well as the prisoners. We learned about different escape attempts, recreation timer and, other instances that happened on the island. While a little eery, I was fascinated by the history of the island and how it transformed over the years. It was neat to see how the island was used, the stories of the cellmates, and the awesome view of San Francisco. It's hard to believe we have only been here for two days and have already done so much. Today we were able to visit two offices. First, we visited Weebly in the financial district, which was pretty close to our hotel. Weebly is a web hosting service that helps users create their own websites. After that, we used a service called "Lyft" to travel to Zynga on the other side of town to visit Adam Stavely's cousin, Grant. 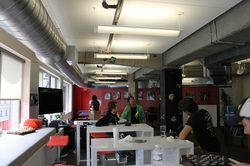 Between these two different visits, we were able to experience even more of San Francisco's start-up culture. We arrived at Weebly around noon and were welcomed by their "Joyologist"/Secretary. 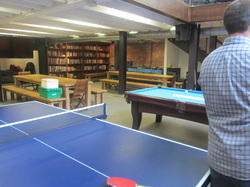 Chris Fanini, Weebly's CTO and co-founder, met us in the lobby and gave us a tour of the main workspace, historical spaces of the building in which they reside, and the recreation room in the basement. We were able to check out the massage/video room and the secret room behind the bookcase. Unfortunately, I cannot divulge what lies behind the bookcase, but I can say that it was pretty awesome! An amazing catered lunch followed this. During lunch we were able to talk to some of the other employees and learn more about what they do at Weebly and how they arrived at their position within the company. Everyone was very welcoming and insightful. It was very reassuring to hear their stories, which were not so different from ours'. I spoke with a 2010 graduate from the College of IST at Penn State and found that we had many similarities. Many people, including the four of us initially, might be intimidated by some of the start-up speakers who visited Penn State. However, after talking to different employees and hearing their stories, I can safely say that there is nothing to fear. As long as you have some aptitude and a lot of motivation, there is nothing you cannot accomplish. The technical skills and knowledge will come to you from the things you experience and the tasks that are laid before you. After eating lunch we talked with a Network Security specialist and then went to get coffee with Chris. He informed us that if we wanted to we would have the opportunity to visit Weebly’s data center and Dropbox on Thursday. We gladly accepted the invitation. It’s not too often students get to experience this many unique companies, and so we want to take advantage of every opportunity. Stay tuned for more information regarding the data center! I didn't think it was possible to see that much of a city in one day. After deciding to do a bus tour, we were able to visit the majority of the landmarks in San Francisco. Many of the places we had wanted to visit later in the week were on the tour, which opened up many possibilities for the rest of the week. Some of the landmarks we visited today were: Golden Gate Park and Golden Gate Bridge, Haight-Ashbury, Fisherman's Warf, Lombard Street, and Chinatown. The tour included a guide and we were able to stop at any of the landmarks and get on a bus at a later time. The pass we received is good for two days, which means we can go as many times as we like. If you ever plan on coming to San Francisco, I would highly recommend this. That way, you don't have to pay for taxi for every single place you visit. You can simply hop off at any stop and walk around and then get back on. We also drove through Haight-Ashbury, which is an intersection in a part of San Francisco that was very heavily populated by hippies during the time of the Vietnam War. This area of the city never left that decade and is still home to many of the people who inhabited it many years ago during times of protest. Golden Gate Bridge is a must see if you visit San Francisco. I would suggest that you walk across the bridge and take a tour bus or taxi back to the city. There is a lookout on the opposite side of the bridge where you can get some amazing pictures. You can then drive up to the bluff to get an awesome view of the city and the bridge from above. Fisherman's Warf is one of the main attractions on the bay. It has a wide variety of shops and restaurants, many of which are relatively affordable. We went to an In-N-Out Burger, which I had never had before. There are also a lot of street performers on Jefferson Street that are worth watching. You should also go to the Hyde Street pier if you have a chance. The last place we walked through was Chinatown, which I can say was without a doubt the most authentic Chinatown I have visited. It is next door to our hotel, so we will be visiting the shops again. It was nice to see an area with such a rich cultural history and some pretty amazing looking food. Overall, the first day was incredible and we are extremely excited for tomorrow. We will have even more pictures and blog posts tomorrow! Heading West to San Francisco! Today's the day! First a big Happy Mother's Day to all our moms! Without you all we wouldn't be doing this! Sorry we didn't get to spend the whole day with you but we'll bring back something cool from the west coast for ya! Our bags are packed, boarding passes printed, and Chase and Adam K are on there way down from PA to rendezvous at Dulles International Airport. Our flight leaves at 10:10pm ET and we touch down in San Francisco at 1am PT. 5 hours and 50 minutes non-stop! We can't wait to have the experience of a lifetime and learn a lot while we are out there! Thanks again to the College of Information Sciences and Technology at Penn State and to the Pomanti Family for their financial support! As always check back here daily for updates on what we are doing and follow along on twitter @Ourstartup and with the hashtag #ISTstartup! Peace out East Coast...We're Cali Bound!